TO CONFESS THAT I am a native Minnesotan who’s never cooked with wild rice may equate a sin. I’m not sure. If anything, such a confession is akin to a Norwegian admitting he/she has never tasted lutefisk. Minnesota blogger Sue Ready, when she learned that I’d never cooked with wild rice, remedied that. She gifted me with a pound of 100 percent wild rice from Quality Rice Products, Inc., Garrison. How kind was that? I’ve never met Sue, who blogs at Ever Ready. But she encompasses what I’ve come to expect in the bloggers I follow—a deep-rooted goodness. If you check out Sue’s blog (click here), you will soon discover an abundance of recipes woven into her posts. She clearly enjoys time in the kitchen. I do not. But I was up to the challenge Sue presented in that bag of wild rice. 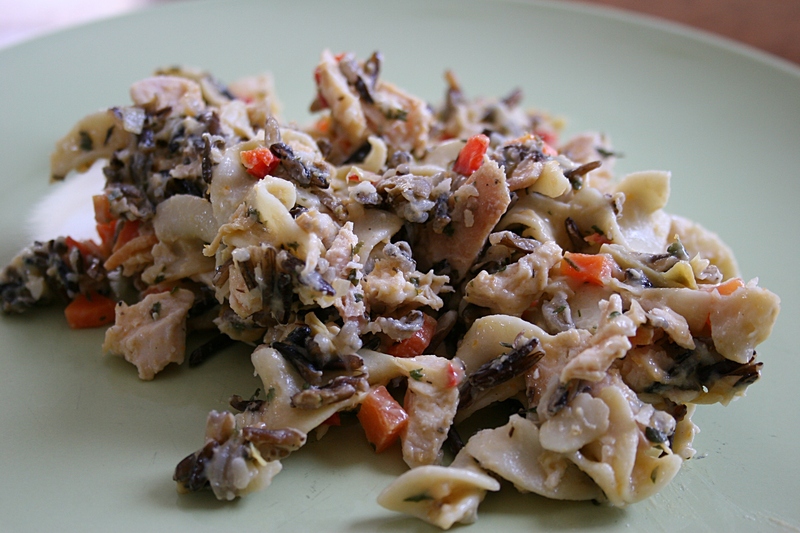 I chose one of her recipes, Artichoke Turkey Casserole, which includes 1 ½ cups of wild rice, for my debut attempt at cooking with northern Minnesota’s beloved grain. Measuring the uncooked Minnesota wild rice before rinsing. The first problem: How do I even make wild rice? I found instructions tucked inside the bag, but then faced my first obstacle. How do you rinse and drain wild rice without the kernels filtering through the colander? Do not use a colander apparently. Next, after cooking the rice for the specified 45 minutes, the grain still crunched beneath my teeth. So I added another seven minutes to the simmer time and called it good, not really knowing whether I’d cooked the rice long enough or too long. 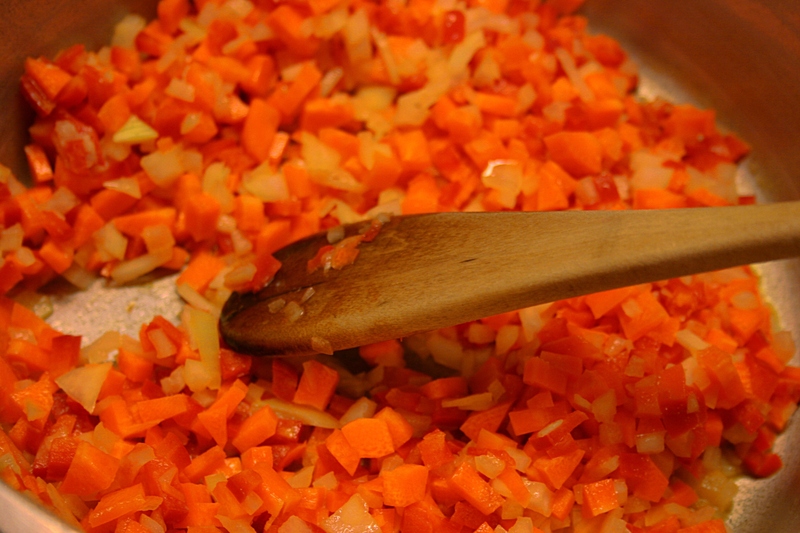 Sauteeing diced carrots, onion and red pepper. Because I’d cooked the rice earlier in the day, I resumed making the hotdish with the dicing of vegetables—carrots, onion and red pepper—and the boiling of noodles. I already had the two cups of chicken (substituted for the turkey) which my husband grilled the previous evening. About 45 minutes later, I had the dish pulled together with the assistance of the husband who sliced artichokes, stirred together cream of chicken soup and milk, and measured cheese while I chopped and sauteed the veggies and tended the noodles. Typically I can multi-task in the kitchen, but preparing this hotdish took way more time than I anticipated and I was getting hungry. And, as everyone in my family knows, I get crabby when I can’t eat at my usual time. A wonderful blend of textures is presented in this hotdish. When I eventually pulled the hotdish from the oven, I couldn’t wait to dig my fork into this truly Minnesotan dish. I suppose an explanation is due here to those of you unfamiliar with Minnesota’s version of casseroles, known in our state as hotdish. Most hotdishes include a cream soup and noodles, this one no exception. I wondered, though, about that combination of noodles and wild rice. But it works. The crunchy texture of the rice kernels pairs well with the creamy consistency of the noodle mixture. Even though this hotdish includes a teaspoon of dried thyme and a tablespoon of parsley flakes, I found the flavor a bit too bland for my taste. Yet, with a sprinkling of salt and fresh ground pepper added, it’s a tasty and filling comfort food for a cold Minnesota winter evening. Now that I’ve assured myself I can cook with wild rice—a food which always intimidated me—I’m ready to try preparing wild rice soup. After all, a cup of raw rice equals five cups of cooked rice, meaning I have plenty of manoomin for additional dishes. Thanks, Sue, for expanding my cooking skills via your gift of Minnesota wild rice. 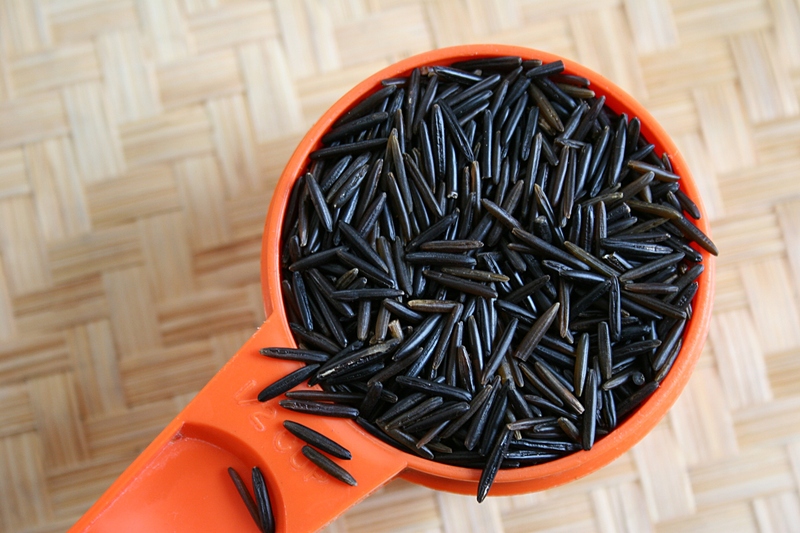 HAVE YOU COOKED with wild rice and, if so, what’s your favorite dish to prepare? FYI: To try Sue’s Artichoke Turkey Casserole, an adaptation of a Better Homes and Gardens Comfort Foods recipe, click here. RATHER THAN DWELL on a single topic today, I’m going to serve hotdish. You know, this and that all mixed together to create this Minnesota-based post. First off, if you follow my writing regularly, you know that I hang laundry outside. But even I’m beginning to wonder about my obsession. When I hung freshly-laundered towels outside Thursday morning, the outdoor air temperature stood at a bone-chilling 17 degrees. Yes, the towels froze nearly instantly. My fingers did not; I worked at a rapid pace. And, yes, the towels were dry when I pulled them from the line at 4 p.m. Even though our proposed 2012 property value dropped $30K, our taxes will apparently increase by 12.6 percent or $72. Now tell me that makes sense? There’s a story here; I simply need to figure it all out. If you dye your hair with an over-the-counter product and don’t use the same color or brand you’ve always used, beware. If your hair shows tinges of orange during the dying process, you should panic. This happened to me once. Wednesday night, with a new color and a new product, the dye appeared white on my head. I do not need white hair to replace my gray hair. But this time I did not panic, trusting that the color would magically transform to the promised “tiki hut.” It did. Whew. I will not need to fire my hairdresser. Back to the money thing. Every time I go to the grocery store, I walk out shaking my head. I cannot believe that I just paid $80 for groceries that fill only two bags. After 10 months of placing cardboard over my living room windows because I didn’t have window treatments for my new windows, I am happy to announce that I have purchased grommet-top panels, the same ones I was eying, oh, about 10 months ago. It is a good thing I waited so long. I got them on sale. My 17-year-old made his acting debut Thursday evening as Dr. Thanatos in the Faribault High School production of Teenage Night of Living Horror. When I heard the name of the play, I laughed. Those teens won’t have to act, I thought. Wrong. 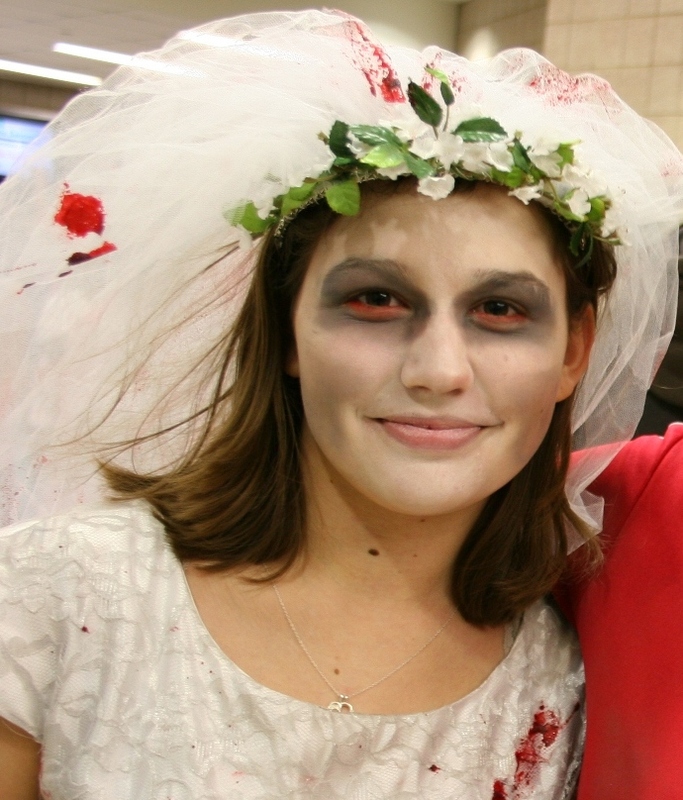 Consider dressing like a Zombie if you attend the FHS play. Here's one of the 25 Zombies from the production. FEEL FREE to comment on any of the above. Let your voice be heard. “I WANT TO COME to your family reunion,” my friend Mike told me recently after I filled him in on all the fun my extended family has at our annual reunion. That reunion happened this past weekend in Vesta, a town of about 300 in Redwood County in southwestern Minnesota. This is the place where my great grandparents, Rudolph and Matilda Kletscher, settled and where their son, Henry, my paternal grandfather, raised his family. Every year on the last weekend in July, we gather here—at the city park if the weather is nice, in the community hall if it’s too hot or rainy—to reconnect. Only once in recent years have I missed the reunion, for a wedding. Otherwise I keep my calendar clear for that date because, honestly, I love seeing my aunts and uncles and cousins and their families and my mom and siblings and their families. 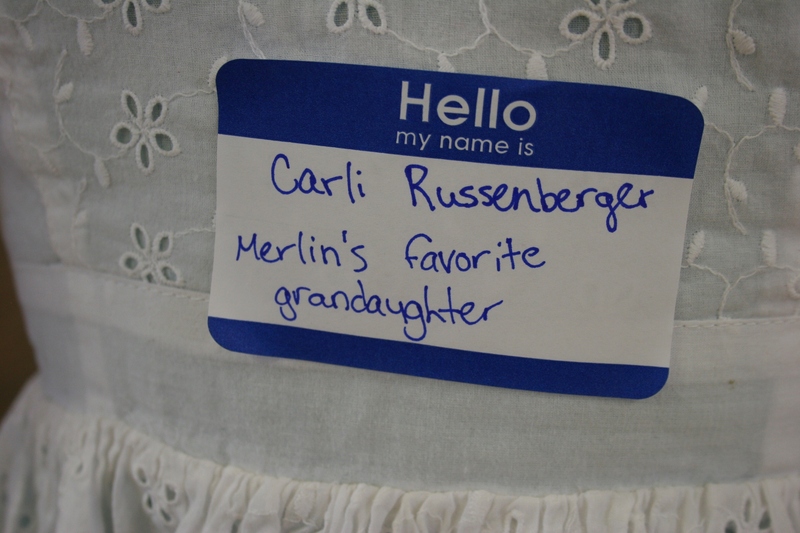 Carli had a little fun with her name tag. My Dad, who died in 2003, grew up with nine brothers and sisters, so you can imagine the size of our reunion, even when everyone doesn’t show up. We’ve finally resorted to wearing name tags the past two years just so we can identify everyone and who belongs to whom. And, yes, even the occasional boyfriend or girlfriend or other friend of a relative attends. We are welcoming that way. Recently we infused new energy into a reunion that, for the younger generation, had become a bit boring. Seems they found simply sitting around, visiting and eating not all that exciting. I totally get that because even I want to do more than sit for hours. Two years ago we added a Saturday evening campfire complete with homemade wine tasting, smores, snacks (Kletscher reunions always include lots of food), singing and old-fashioned games like gunny sack and 3-legged races. My cousin Vicki and her husband, Dave, also created a texting competition popular with the teens and young adults. Family members toss ears of corn during the old-fashioned game competition Saturday night. This year we didn’t have a campfire, but we still met at the park until the heat, humidity and mosquitoes chased us out around10 p.m. But we got in those old-fashioned games, with an ear corn toss added this year. Vicki and Dave also planned a few other games, including a treasure hunt. I teamed up with two cousins and an aunt and her elementary-age grandchildren. Smart move. When we adults determined that the clue “pop, popcorn and hot dogs” meant a concession stand, we pointed across the softball diamond and told the granddaughters to run. They did. We cheered them on. More games continued following Sunday’s potluck. And let me tell you, the Kletschers know how to cook. Hotdishes crammed nearly every inch of one banquet table with salads and desserts jammed onto another. 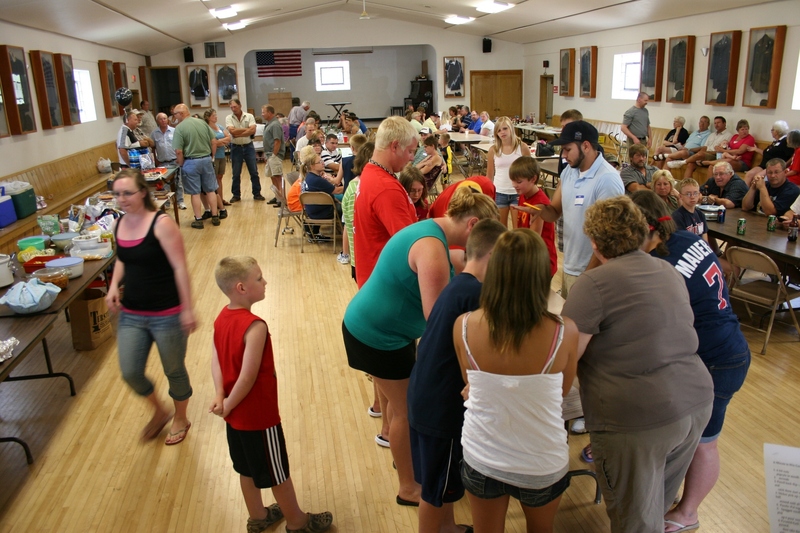 Contestants in the Minute-to-Win-It competitions gathered around a table right after the potluck. To the left you'll see some of the food that family members brought. Many dishes had already been removed from the table. We’d barely finished our meal when my sister Lanae set up the first of several Minute-to-Win-It games she pulled together. I stepped up to photograph the action. Last year I was in the thick of it, planning activities and leading a family trivia competition. This year I wanted to observe the fun. And the kids had a blast. I could see it in their smiles and hear it in their laughter and in the pounding of their feet racing to the prize table. 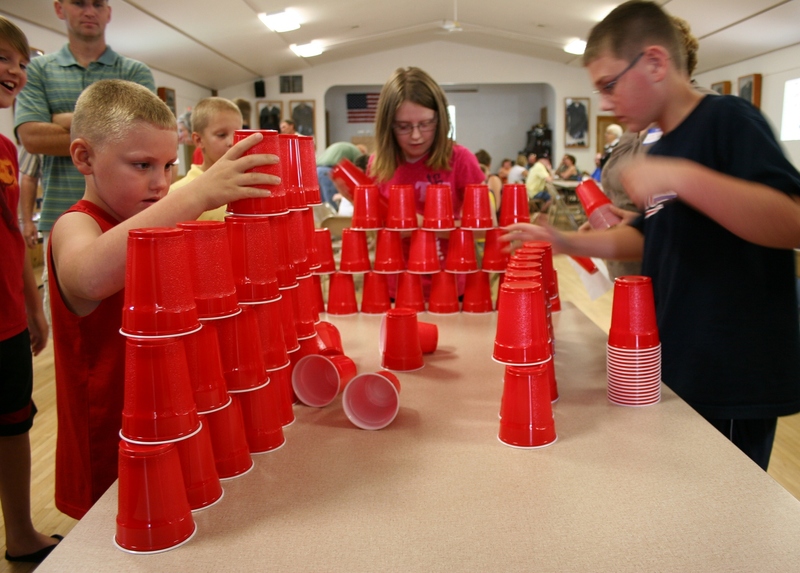 Contestants had a minute to stack 36 plastic cups. 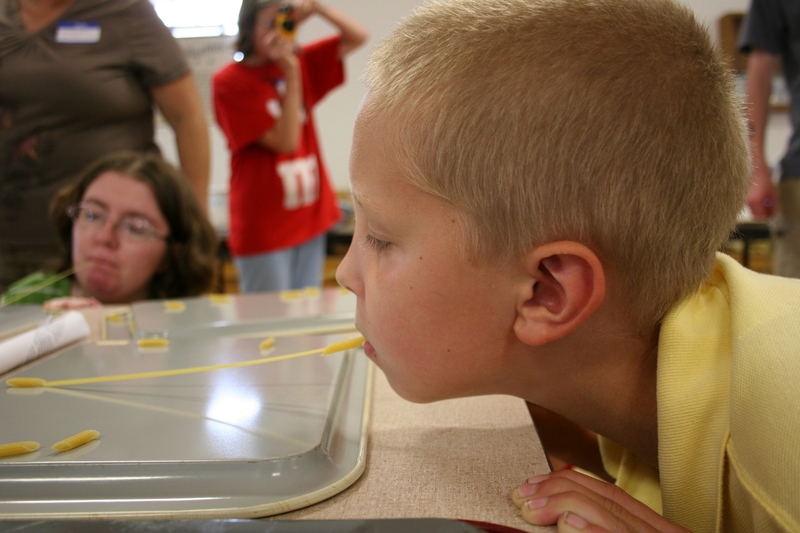 In another minute event, competitors maneuvered pasta onto spaghetti. All ages participated in a rock-paper-scissors tournament coordinated by my cousin Jeff. I lost in the first round. 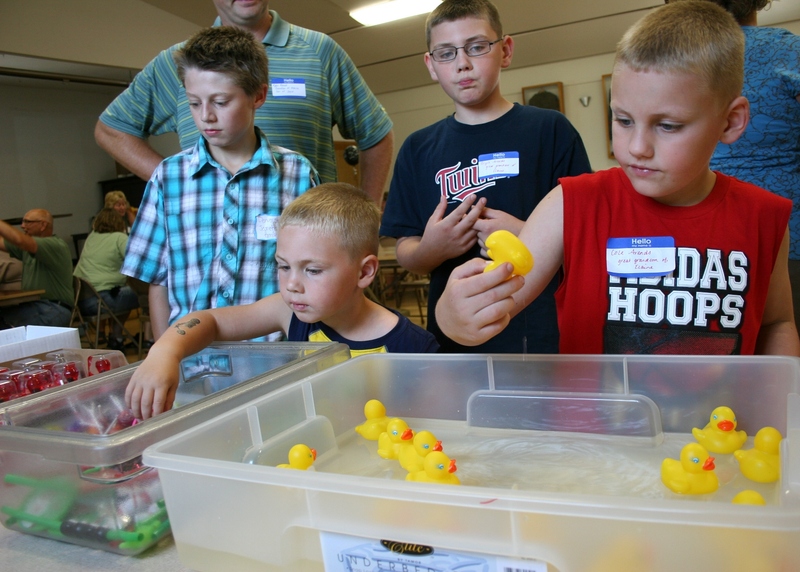 The younger kids could select a duck from the duck pond and win a prize. Family members lined up to get temporary tattoos and their faces painted. I was among the first to get a tattoo. My cousin Greg, who didn't know about the tattoo parlor, saw my butterfly tattoo from across the community hall and said, "I didn't know Audrey had a tattoo." Well, now you know, Greg. While planning games takes time and effort, it’s almost a necessity if we are to keep the young people interested in our reunion and connected as a family. By competing against each other or working together as a competitive team, they are getting to know one another. They are building memories. Even my 17-year-old, who in years past grumbled about attending the family reunion, now looks forward to it. He protested when we told him we had to leave late Sunday afternoon for the 2 ½-hour drive back to Faribault. Already the family in charge of next year’s reunion has selected a Mexican theme and is talking piñatas and tacos. We laughed at the idea since we’re a bunch of Germans. But we’ll go along with the theme, as long as we can bring our sauerkraut hotdishes.